Lopes gather at one of 10 homes refurbished Saturday as part of Serve the City. A family that paints together stays together. 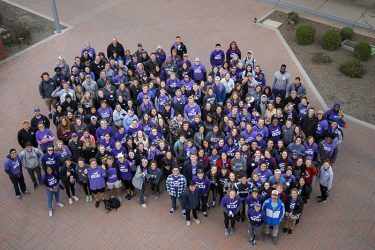 The Lynch family banked on it as they gathered on the Promenade early Saturday morning in bone-chilling 40-degree weather with more than 200 Grand Canyon University volunteers for the semiannual Serve the City. The plan: Not to paint the town red, but to paint it GCU purple, at least in spirit. While Havoc Ally Lynch wrapped herself up like a burrito in a hammock and camped out for a front-row seat to the men’s basketball game that night, the rest of her family was grabbing a breakfast burrito before fanning out to one of 10 homes being refurbished by GCU and Habitat for Humanity Central Arizona as part of Serve the City. For the second year, parents had the chance to work on those home renovations alongside their children at the volunteer event, which is primarily student-manned. “We began inviting families last year as we received an increasing number of comments from students and parents that we should invite families for an event in the spring,” said Charity Norman, Director of Welcome Programs in the Department of Student Affairs. Painting and landscaping were the call of the day. “It was really exciting because there were families that contacted me saying we did Serve the City last year and we were so moved by it that we wanted to do it again,” added Andrea Northup, Habitat of Central Arizona Faith Relations Manager and a GCU Business Management graduate. One family excited to return to campus and lend a hand was the Lynch family. He and his wife joined their other GCU daughter, junior social work major Anna Lynch, on one of the home-renovation sites. Junior social work major Anna Lynch (center) tackled some painting. Her parents (not pictured) flew in from Washington also to help out. The Parent Council first joined Serve the City in 2018 at the impoverished Garcia Elementary School, where 50 of GCU’s College of Education students participated in a pre-service resident teaching program. Volunteers replaced pea gravel, painted a playground wall and painted stripes on a basketball court. “It was really fun to come in the morning and then return later in the day and say, ‘Oh my goodness. Look what we did,’” said Parent Council member Ed Roddy of Lynden, Wash., who flew in for a council meeting and to lend a helping hand at Serve the City for the second year. 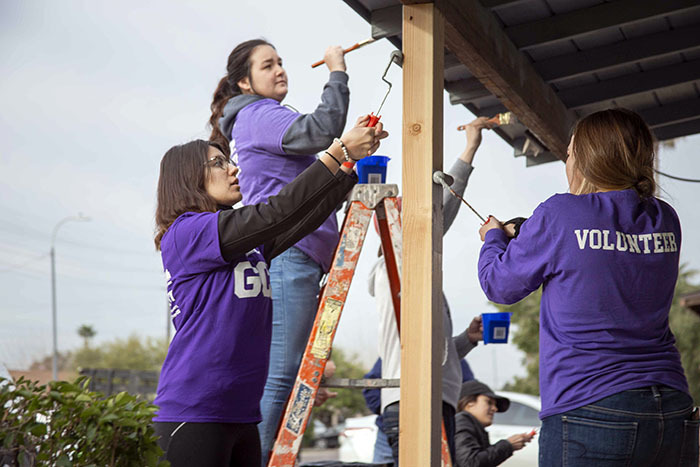 More than 200 Lopes readied themselves for the day’s neighborhood revitalization projects. 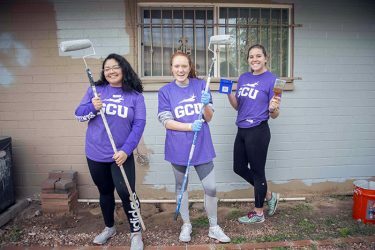 Serve the City is a signature event as part of Operation Revival, GCU’s neighborhood revitalization initiative in the Canyon Corridor. 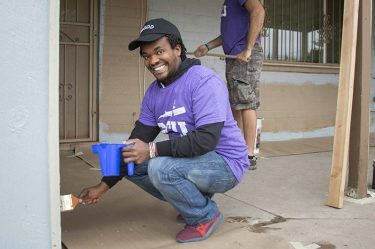 Habitat and GCU aim to renovate 700 homes in the neighborhood surrounding the campus and in Maryvale and restore the area back to what it once was — a middle-class neighborhood. 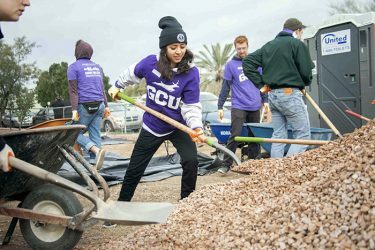 “This project is a marriage, a partnership, between Habitat for Humanity Central Arizona and Grand Canyon University because we are a force for good in this neighborhood like no other,” Habitat Board Chairman Tim Kelley, Assistant Professor of Entrepreneurship and Economics in the Colangelo College of Business, said of the project, which launched in January 2015. “The values of property since this project began have risen by over 50 percent, crime is down by 30 percent. You can drive the streets and see the beauty that had simply degraded over decades before we began this. More than 220 unique homes have been refurbished so far. The partnership also has provided more than $1.4 million in home repairs, and more than 3,700 employees and students have volunteered nearly 20,000 hours. Five years into the initiative, Serve the City continues to be “that momentum that keeps us pushing forward,” Northup said. 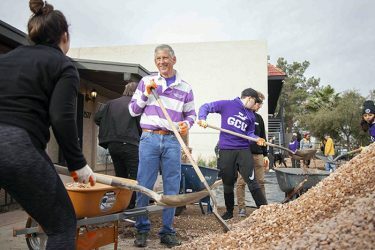 GCU President Brian Mueller lent a hand. Parent volunteer Mark Lynch embraced that momentum as he and a group of about 20 arrived by foot at the Mariposa Street home of Oscar Perez, about a mile from campus. He shook Perez’s hand and chatted with him before starting the four hours of painting alongside the rest of the Lynch family and other GCU and Habitat volunteers. Not that Perez didn’t jump right in, too. Perez and his family have lived in their home since 2012. He said the neighborhood has improved since GCU’s arrival. He sees more police around, giving a nod to another University initiative — the Neighborhood Safety Initiative with the Phoenix Police Department. “I feel more safe,” said Perez, who found out about GCU and Habitat’s home-renovation projects after seeing a flyer. Nursing senior Vianna Demetrulias was a first-time Serve the City volunteer. With a paint roller in hand, she joined her mom, Jennifer McCormick of Cave Creek, in helping Perez beautify his home. “My mom was actually the one who brought it up,” Demetrulias said. Many of the home renovation projects were within walking distance from the campus. “I thought it would be a really good project — something fun to do,” McCormick said. Demetrulias didn’t mind that she was working alongside her mom. Besides the parent volunteers, several GCU groups signed up to make a difference in the community, too. Marketing sophomore Cammie Craycroft, a member of the University’s Global Outreach, said the team volunteers for Serve the City every semester. “It just feels good to serve the community around us,” she said. Mechanical engineering major Bianca Giorgi volunteered with a Welcome Programs team that was divided among several homes. Mechanical engineering major Bianca Giorgi (left) volunteered with others from Welcome Programs. 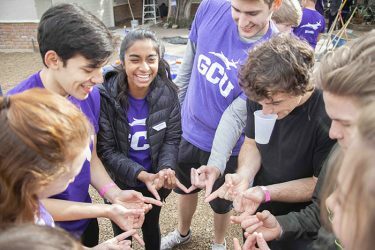 “It’s just really great to have the opportunity to not just serve within the community at GCU but the community outside,” she said. She worked beside Charity Norman at Steve and Charlene Atkinson’s home on Meadowbrook Avenue. Venturing outside the University takes students out of that safe bubble on campus and connects them to the outside world, Giorgi said. Junior mechanical engineering major Matthew Hopper, a Serve the City student leader, said he discovered Serve the City his freshman year. “It’s amazing to just come out and be the literal hands and feet of Jesus to the community,” said Hopper, whose engineering skills come in handy on Habitat projects. He remembers how the homeowners at one house became emotional about all the help they received. So far, more than 220 unique homes have been renovated as part of the neighborhood revitalization initiative. Partners GCU and Habitat for Humanity want to refurbish 700 homes in the Canyon Corridor. The Atkinsons have lived in their home for three decades. Charlene saw postcards about the chance to have GCU and Habitat renovate their home. And it was — students, parents and all. Contact GCU senior writer Lana Sweeten-Shults at 602-639-7901 or at lana.sweeten-shults@gcu.edu.